The underground story of Cobra, the 1980s’ illicit handmade computer - GeekCast en Español..
What happen if you mix a very creative individual, with some electronic skills and imagination, a technological revolution happening in the world and the right tools, and lest the hacking begins. Launch a revolution in a country where the right things are in place is hard, but not as hard as doing the same when you face all odds against you and even in that conditions you can survive. Maybe nobody will ever call you a genious or the Tech Guru that changes the world, but your footprint will prevail in the minds you change. Mihai Moldovanu against all ods became the true hacker of Rumania by changing the world where it need the most. In their poor, Communist country, Romania’s computer curious built an underground industry, even tough the police and authorities can send him to jail. Mihai Moldovanu grabs the cardboard box with the enthusiasm of a man from the future who’s opening a time capsule. “Maybe it could still work,” he tells me. An athletic geek now in his mid-40s, Moldovanu has always been crafting DIY projects. In the local open-source community, he is better known as one of the creators of the first Romanian Linux distribution, TFM, that’s still used by local companies. His 9-to-5 job is that of a System Administrator for a fin-tech company in Bucharest. What Moldovanu’s holding isn’t some hobbyist kit potentially familiar to tech tinkerers back in the states. In the mid-1980s, Romania was a poverty-stricken, Communist country. 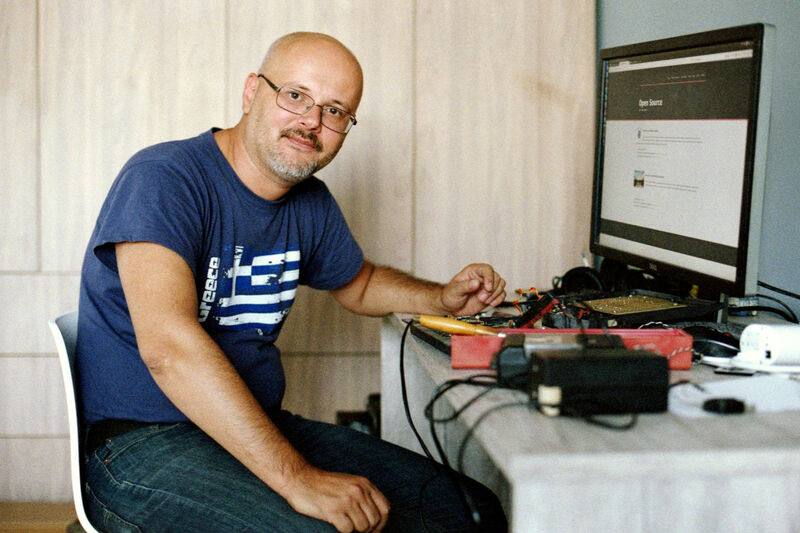 So like a handful of his fellow students with a similar undeniable passion for computing, Moldovanu soon became one of only a few dozen underground computer builders in the country. They illegally manufactured computers using parts smuggled from factories and heaps of manually soldered wires. But armed with very few resources and plenty of creativity, people like Moldovanu soon fueled an underground hardware industry that would birth some of the country’s best future tech professionals. To a young Moldovanu, computers were magic. The country he grew up in barely had access to landline telephones and black-and-white TV sets, and he rarely came across Western goods. Romania had its borders closed tightly. For the average citizen, there were no opportunities to travel or to receive accurate news regarding what was the state of technology in the West. Instead, during the last years under dictator Nicolae Ceaușescu in the late 1980s, people would wake up at 5am to stand in line in front of stores for their modest food rations. Electricity was often cut to save money; heating was, too. This was the environment when the underground tech industry started: around 1985, four years before the bloody Romanian revolution that knocked down Communism. Back then, Romania’s hardware industry mainly cloned the British Sinclair ZX Spectrum, a machine released in the UK in 1982. This device was copied all across Central and Eastern Europe. The ZX Spectrum was an 8-bit personal computer built around a Zilog Z80 A CPU running a BASIC interpreter, an easy-to-use programming language widespread on microcomputers at that time. It used a TV set as a display and audio cassettes for storage. If militia officers caught Moldovanu and colleagues while they were selling computes, however, it’d matter. The authorities could seize the students’ electronics, make them pay fines, and could expel them from the university for starters. Given how dire daily life was for Romanians at the time, something as little as a pack of Western cigarettes would buy anything that could be smuggled from a factory. So the Politehnica students leveraged their resources to obtain some Cobra motherboards and independently started to build computers on top of those. Soon, an entire supply chain was formed. Electronics dealers came to the campus with computer parts, LEDs, and resistors, which they sold in bulk. The students became fond of Cobras, as they featured not only BASIC but also CP/M, an operating system created for Intel 8080/85-based microcomputers. The builders used whatever was available on the black market; no two computers ever seemed to come out alike. Lucky owners fit their Cobras into cases from another Romanian ZX Spectrum clone, the HC. Others used manufactured metal or wooden boxes. In this closed Communist country with choice regulated by the state, Cobras gave their owners some feeling of independence and rebellion. “The fact that you could play the game you wanted, when you wanted, gave you the illusion of choosing for yourself,” Moldovanu says. Three decades later, he still knows by heart Highway Encounter, Chuckie Egg, and Nether Earth, which featured Isometric 3D Graphics, meaning that it was 2D, but looked 3D-ish. Moldovanu was amazed at the graphics, and so he began studying the algorithm to learn how it was possible to achieve them.